ATTENTION EUROPE! CLINT WILSON IS COMING to FLATSTOCK! Nakatomi fellow, Clint Wilson is headed to Flatstock Barcelona, and is checking out the rest of your crazy old continent while he’s there! Go beat him with a baguette, run your bulls at him, or pelt him with a rain of Euros! Hide your Royal Jewels, WILSON IS COMING! The above print is 4 colors 18×24 and will be available for free to anyone who purchases prints at my booth at the event. 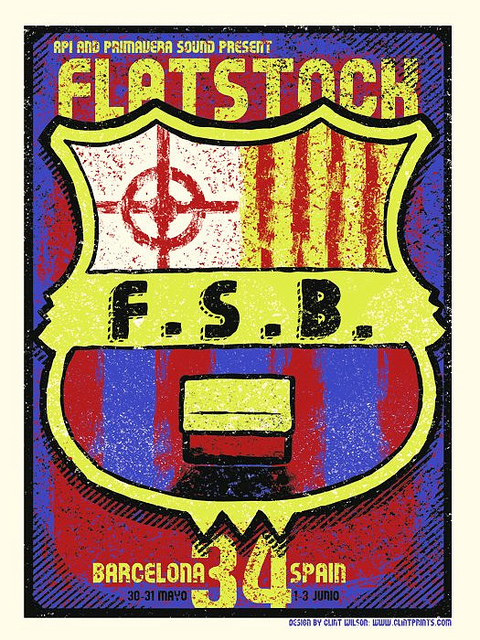 The fair will be complemented by a free exhibition called “Flatstck: The world of Music Posters” form the 15th of May until the 3rd of June in the Virreina Centre de la Imatge, where a selection of 50 works chosen by Flatstock as well as some posters by renowned Catalan artists will be on show. The exhibition will form part of the San Miguel Primavera a la Ciutat activities, an initiative that aims to spread the spirit of the festival to every corner of Barcelona. Flatstock is a project of API (American Poster Institute) that unites music and the visual art. This non-profit organisation is dedicated to promoting music posters and, since its beginnings in San Francisco a decade ago, has not stopped growing . Before the festival begins The Poster Collective will be presenting a gallery show of all of the artists involved in the Primavera Sound Flatstock. Photos/videos will be posted here on Clintprints.com after the trip so stay tuned! We will stay tuned, Clint! Now, watch out for those Hostels while you’re there! I saw a documentary about it once, called “HOSTEL”. It…didn’t look fun. ← New from Jon Smith- ‘PORTLANDIA’ and Breaking Bad prints!